Poppy Seed Lemon Cake w/ Raspberries - Let the Baking Begin! Recently I posted a recipe for the Starbucks Lemon Cake and several of you commented saying that you love the cake, but it deflated after you got it out of the oven. I had an idea of why it’s happening, but I needed to make one more cake to investigate what might be causing the ‘great fall’. This is how this cake was born. I decided to use the lemon cake base, add some raspberries, Chantilly Cream and make it into a cake. Needless to say it was delicious! So there are several things that I changed. First off, I went to the blog of the original poster of the recipe and I noticed that she says to use ‘4.3’ oz packet of instant pudding, but there is no such size. The only ones available are the 3.4oz or the 5.1oz. Then, I looked at the picture of her ingredients closer and found that she shows a picture the large packet (5.1 oz) not the small one, like it notes in the recipe. So that is the first change I made in my recipe, I used the 5.1oz packet of instant pudding. Second, I theorized that deflating might be caused by overbeating the dough. The dough already has leveneres, so when you beat the additional air in, the bubbles expand beyond the capacity of what the dough can handle once in the oven, so it deflates once you take it out of the oven. What does that mean? It means that you should only mix the ingredients on LOW speed and only for about 30 seconds. Sifting the ingredients before combing the wet & dry, will prevent the lumps from appearing in your final product. I do have to say that making a cake with a boxed mix goes against every fiber of my being, but hey, if it tastes good, why not, huh? I will continue to look for a recipe that can replace the boxed mix, but if any of you that don’t mind it, then go for it! 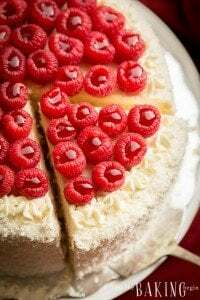 Someone who’s new to the whole baking thing, will really appreciate this recipe because you will love not only making and but eating this cake as well! 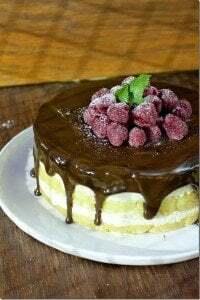 You will notice that I usually don’t include the instructions to level you cakes, because I always use the baking strips which make all of my cakes come out without the puffed up domes, but if you do not have them, go ahead and level the cakes before stacking. So go ahead, give it a try! Poppy Seed Cake – Simple poppy seed cake with a dulce de leche buttercream. 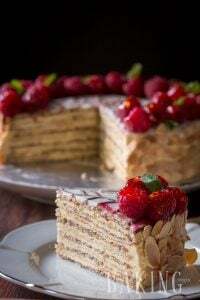 Russian Royal Cake – Cake with poppy seed cake with walnuts, and cherries. Peaches & Cream Layer Cake – Sponge cake with peaches and sweet cream. Turn oven to 350F. Line two 9 inch round pans with foil & spray with non stick spray, or butter and flour the pans. Wet the baking strips (see bottom of post to see what they are) and secure around the pan. Set aside. Combine all the wet ingredients and whisk until well combined. Sift the cake mix & instant pudding into a mixer bowl, add about 1 cup of wet ingredients & the poppy. Beat with a mixer on low speed (important!!) for about 15 seconds, then add the rest of the ingredients and beat on low speed for another 15-20 seconds. DO NOT over beat, or your cake will deflate. Put 1/3 of batter into one pan and 2/3 into another pan. Place in the oven and bake for 25-35 minutes, until slightly golden in color or until a toothpick inserted in the middle of the cake comes out clean. Start checking when you can smell the cake in your kitchen. Remove the cake with less batter out of the oven first (it will be done sooner), then take out the second cake. Let rest in the pan for 5 minutes, before removing and allowing to cool on a cooling rack. Beat cream cheese & sugar until smooth and no lumps appear. Add the heavy cream & vanilla extract, then switch to a whisk attachment. Whip the frosting until it holds shape and does not run. Cut the thicker cake in 2 even layers. Place a dab of frosting on serving plate. Put the first cake layer on top. Cut 4 strips of parchment paper, thick enough to cover the edges of the serving plate, and put them slightly under the cake completely covering the plate. Spread about 2 tablespoons of frosting on top of the cake. Put half of the raspberries on top and cover the raspberries with 1/3 frosting. Place another layer of cake. Repeat with raspberries and frosting. Cover with 3rd layer of cake. Cover the whole cake in a thin layer of frosting. Take a palm full of processed cake crumbs and press all around against the sides of the cake. Fit a pastry bag with 104 Wilton tip (rose petal tip). Fill the bag with leftover frosting. Starting from the outside ring of the cake, start piping the petals in circles until you get to the middle. See YouTube video below on how to do this. Place a couple of pearl dragees in the middle. Keep cake chilled until ready to serve. I made the cake using a lemon box cake. Then, used my own lemon cream cheese frosting with a layer of raspberry curd between the cake and frosting. It was devine! While reading the recipe, I was surprised by the “mix on low speed for 15 sec. and then add the rest of the liquid ingredients and mix on low another 15-20 sec. I did sift the dry ingredients, but my cake was very lumpy at this point. BUT, not wanting it to fall, I followed the directions and told myself, this better turn out right… WOW! did it ever turn out right. I brought it to the luncheon following worship on the Sabbath, and it was gone in a flash. The cake was light as a feather and very yummy. Thank you for the wonderful recipe and directions. The little bit of lumpy in the batter as it went into the oven didn’t make a bit of difference. Made this cake and had no issues with it falling down! 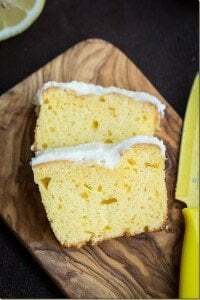 I was a little worried it would taste too lemony because husband is not a fan of lemon flavored desserts but he loves this cake and the lemon is so subtle it only enhances the flavors of the cake! Def will make it again thank you for the recipe! Marina, I am so excited to finally give this cake a try. I have been looking and looking at it but could never find the time to make it. So I need your help before I actually make it. Do you think this cake is best assembled the same day it is to be served? Or is it okay to bake the cake layer and frost it the night before? Suggestions!? 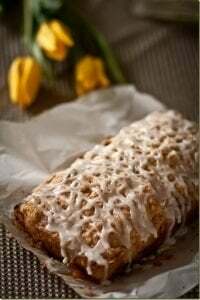 Your cake looks luscious, it would be a great way to use our raspberries that are growing in our yard. Your pictures look beautiful as usual :). yes, that is definitely a good idea! thank you! This cake looks amazing. I love anything with citrus in it.